As you might have read from the blogpost-title it's about a holo-polish AND I promised you in the last post that I'll post this mani next, so here it is: Glam Nails Rainbow. It is, like Larissa a 5ml bottle but damn, their brush is excellent! Even though the bottle tiny is they somehow managed to manufacture a brush which is quite wide and spreads out perfectly- I'm in love with the both shades I have and would certainly buy other shades that appeal to me. For the manicure I used 3 coats each of the two polishes, plus a basecoat and a coat of ridgefiller- no topcoat because I didn't want to sacrifice the Holo-effect. 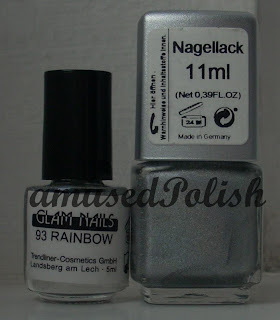 I thought nagellack was a swedish word? You use it Germany too or it's just the name of the polish?